Streetsblog's Queens crew spot-checks the ride to the beach. For some, a simple day at the beach felt more like a day waiting for the bus. Our eyes on the street in Queens sent us pictures this morning of a crowded Q53 bus from Woodside to the Rockaways — an SBS line that the MTA created last fall that has reduced weekday commute times, but appears to be giving weekend riders the summertime blues. “Hey @MTA you HAVE to run more Q53 SBS to Rockaway on summer weekends. The buses are full to the breaking point from the first station in Woodside!” Angela Stach tweeted. 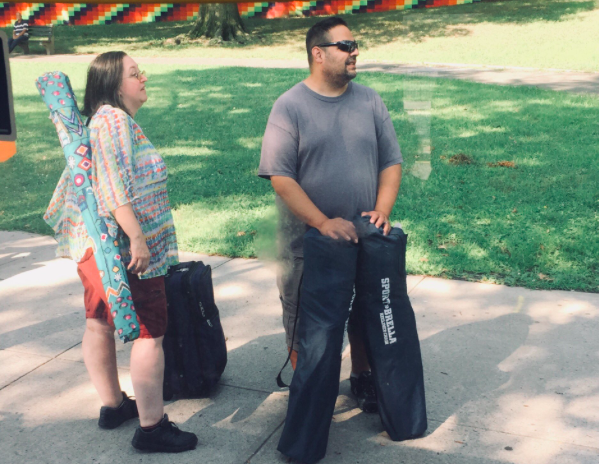 She told Streetsblog she arrived at the route’s second stop at Broadway and 75th Street in Jackson Heights at 9:30 a.m. and waited 10 minutes before the bus arrived, already packed with beachgoers. Photos back up her assessment. A subsequent tweet shows some would-be riders unable to get on the packed bus. These people could not even get on the bus because it was so crowded. Stach, who uses her bike to get around, said she only took the bus because there is no protected bike lane on Cross Bay Boulevard, a vital link to the Rockaways. “Biking to Jacob Riis is safer but a huge detour from Jackson Heights,” she tweeted. According to MTA Bus Time, SBS departs the Roosevelt/61st Street stop every 12 minutes. But gaps between buses further down the line stretch to 18 minutes. It is unclear if Rockaway-bound beachgoers experience this level of service every summer weekend. Service was certainly working well on July 20, which was, alas, a Friday. A day later, a driver was forced to leave passengers waiting at the same stop where Stach had her troubles today, tweeted Carlos Bolanos. This story will be updated later. It’s not only beachgoers – residents have difficultly catching this bus on any sunny weekend day to go home or to be able to leave Rockaway. The SBS has made it better than years past but there is still a lot of room for improvement and definitely a need for camera bus lane enforcement because it’s often blocked along the way causing delays. They also have to be much better at deploying extra buses on very hot days. We have reached a saturation point on the peninsula with private cars – we need to make alternative transport as quick and efficient as possible so people leave their cars at home. In my experience, they run fairly smoothly when the Queens Blvd. local is running but when there’s construction that takes one of the tracks out of commission you definitely pay the price. Honestly they need to amp up service on the weekends during the summer. I mean the Q53 is easier route for those whom doesn’t want to go thru Manhattan on the A train. Even with artics still need to increase service. Select Bus Service is live on Woodhaven Boulevard and Cross Bay Boulevard in Queens. As of Sunday, the SBS package - off-board fare collection, camera-enforced bus lanes, and other transit-priority treatments - is speeding trips for tens of thousands of people who ride the Q52 and Q53 each day. Neglecting to talk to bus riders, NY1 reporter Ruschell Boone gives Woodhaven Boulevard SBS the driver gripefest treatment.